ships that will replace them - the comparison is shocking! 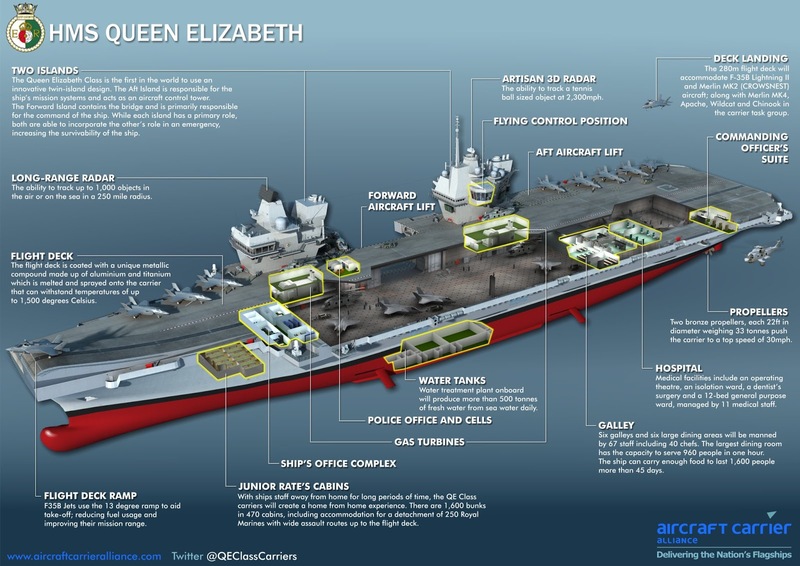 The Queen Elizabeth class aircraft carriers will be the biggest and most powerful warships ever constructed for the Royal Navy. 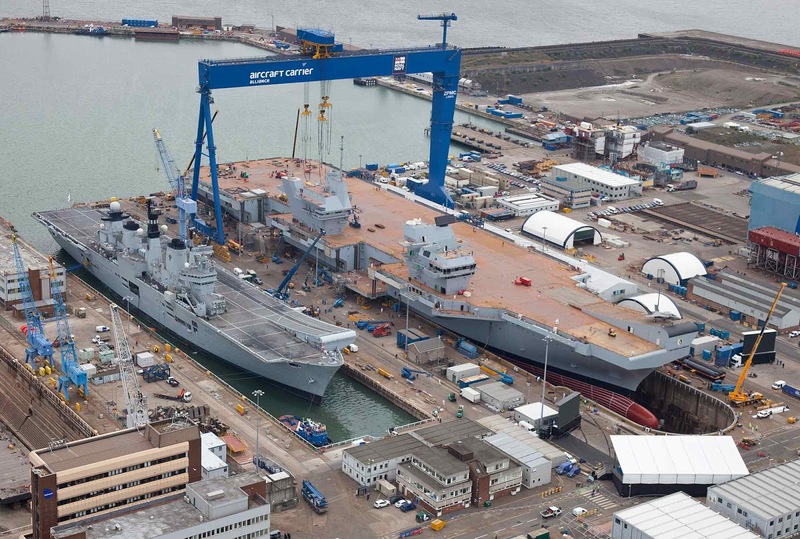 The first ship, HMS Queen Elizabeth is due to enter service in 2020. 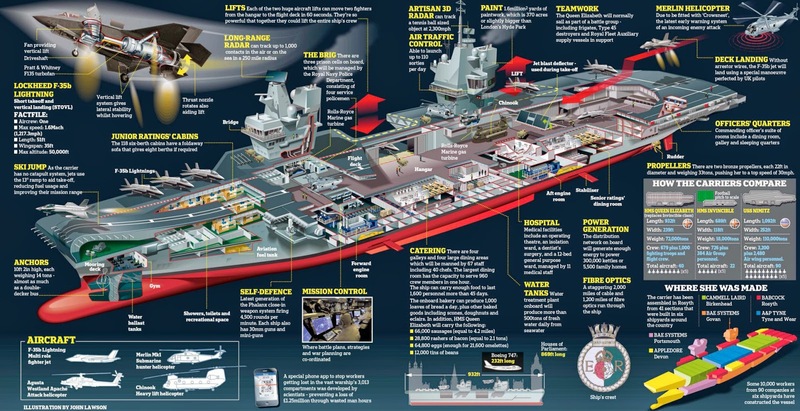 Some key facts about the class by the Aircraft Carrier Alliance. The ships will be 65,000 tonnes at full displacement - over three times the size of the Invincible Class aircraft carriers. The length is 280m - 90m longer than the Invisible class aircraft carriers while the width is 70m - twice the Invisible's width. Each ship has two propellers which together will output some 80MW of power - enough to run 1,000 family cars or 50 high speed trains. The distribution network on board will manage enough energy to power 300,000 kettles or 5,500 family homes. Each ship's two propellers will weigh 33 tonnes each - nearly two and half times as heavy as a double decker bus and one and half times as high. Each of the two huge aircraft lifts can move two Joint Strike Fighters from the hangar to the flight deck in 60 seconds. They're so powerful that together they could lift the entire ship's crew. Each of the QE Class aircraft carriers can take up to 40 aircraft, both rotary and fixed wing. There will be a 110MW power station on board each ship - that's enough to provide all of Portsea Island with power. The anchors will be 3.1m high, each weighing 13 tonnes - almost as much as a double decker bus. The ships on-board water treatment plant will produce over 500 tonnes of fresh water daily. 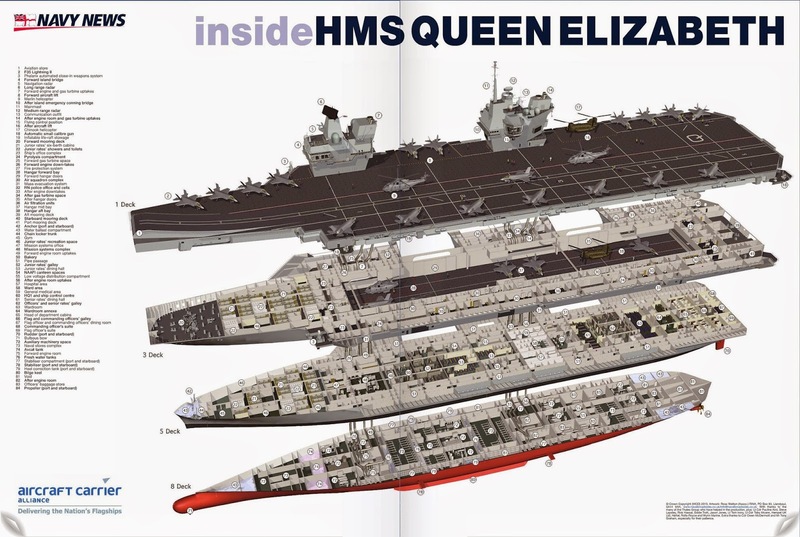 Enjoy a very informative work about Queen Elizabeth class aircraft carrier of Royal Navy by John Lawson. Save the image to view the details: Queen Elizabeth class aircraft carrier. High resolution image here. The interior of the aircraft carrier, an artwork by Ross Watton (navalbroadsides.co.uk) for UK Ministry of Defence.